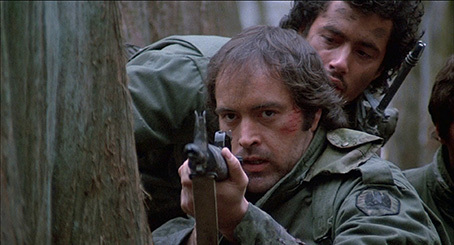 Walter Hill's gripping 1981 survival thriller SOUTHERN COMFORT boasts a stonking cast and has aged damned well, and looks better than expected on Second Sight's Blu-ray, reviewed here by Slarek. "Civilian in peace, soldier in war. I am the guard." Imagine the scene. You've come to the cinema to see a thriller that has been attracting exciting reviews, you find a good seat, the lights go down, but instead of the movie you're subjected to a trailer for a frothy American romantic comedy. Perhaps because there's little you dislike more than frothy American romantic comedies, it seems to go on for ever. When it finally stops, another one begins. Then another. And another. How many romantic comedies can there possibly be on release at the same time? Utter despair looms, and then a fifth trailer begins. A deep sinister note fills the cinema and the screen is dominated by a huge close-up of a compass, the sort that a soldier might take on manoeuvres. So dramatically and effectively does this break the depressing spell cast by the preceding dross, that a semi-orgasmic surge of pure electric joy surges through your body. And the trailer that unfolds proves as seductive as this opening audio-visual thrill has led you to expect. By the time it concludes, you've forgotten all about the film you came in to see and are completely focussed on one that you won't be able to watch for another three or four weeks. This, dear readers, was my introduction to Walter Hill's riveting 1981 survival thriller, Southern Comfort. Back in the early 80s, I had a close friend whose taste in film was almost organically joined to mine, and for us Walter Hill could do no wrong. His directorial debut Hard Times (released in the UK as the crudely retitled The Streetfighter) gave Charles Bronson one of his best ever roles. This was followed by The Driver, a precision-executed existentialist crime thriller in which man and machine were presented as mutually interchangeable. And then came The Warriors, a film we obsessed over and whose future cult status was writ large over every gloriously stylised frame. Then Hill made The Long Riders, a retelling of the story of that most famous of outlaws, Jesse James, a film that spun on the seemingly gimmicky concept of having the James, Younger, Miller and Ford brothers played by real acting siblings James and Stacey Keach, Keith, David and Robert Carradine, Dennis and Randy Quaid, and Christopher and Nicholas Guest. But it worked. And how. It looked authentic, had a superb score sourced largely from traditional tunes by Ry Cooder, and was arrestingly performed. The real revelations here, for me at least, were David and Keith Carradine. Sure, I'd been a fan of David in Kung Fu, but that was more down to my adolescent fascination with martial arts than the actor who was faking the moves (and let's not forget that Bruce Lee was originally up for this role), and aside from his compelling role in Ridley Scott's The Duellists, I'd never been that taken by his half-brother Keith. But both were terrific here. And Hill himself appeared to have changed gear. 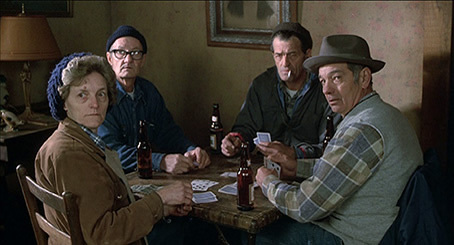 Gone was the comic book stylisation of The Warriors in favour of a post-Culpepper Cattle Company feel for how the Old West might actually have looked, crossed with a handling of action and purposeful use of slow-motion and cross-cutting worthy of Peckinpah (Hill, it should be noted, was the screenwriter on Peckinpah's The Getaway). I could go on, but I'll save that for the day The Long Riders appears on UK Blu-ray (which it now has, also curtesy of Second Sight). Southern Comfort was Walter Hill's follow-up to The Long Riders and proved its equal in the muddy realism of its setting, a Ry Cooder score that draws on traditional tunes, and in the Peckinpah-esque use of slow motion and editing. The set-up is intriguing. A group of Louisiana National Guardsmen have gathered for a training weekend in the Bayou swampland armed only with blank rounds. When Bravo Team, led by the authoritative Staff Sergeant Poole (Peter Coyote), become lost in the woodland, they stumble across some canoes belonging to local Cajun hunters and borrow them to avoid having to retrace their steps. They are well on their way when the rightful owners appear on the shore behind them, and a half-hearted attempt by the guardsmen to communicate their intentions is brought sharply to a halt when one of them fires a blank-loaded machine gun at the Cajuns as a prank. The hunters respond by shooting Sergeant Poole in the head. The shaken platoon scramble their way to the far shore, where a deadly game of cat-and-mouse begins, as the soldiers fall victim to their own inexperience and the unseen Cajun hunters. From the opening scene, this is a story driven and enriched by its characters, with each member of the platoon serving a specific role in the narrative. Our window into this world is group newcomer Hardin (Powers Boothe), a hardened cynic who has transferred from Texas and regards his new comrades with weary disdain. 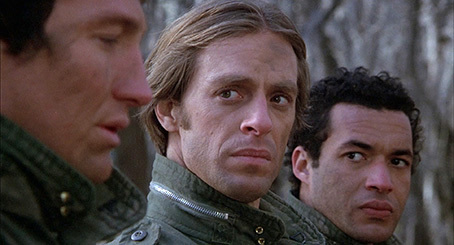 He's befriended early on by the easy-going Spencer (Keith Carradine), whose procurement of prostitutes for the conclusion of manoeuvres provides the prime motivation for his comrades' decision to borrow the canoes. Other characters are quickly and economically drawn. There's the immature Stuckey (Lewis Smith), whose blank-bullet gag first kicks off the conflict but whose popularity sees him avoid being ostracised by the others. There's hard man Reece (Fred Ward), who takes a particular dislike to Hardin when forced to surrender his live ammo by the newcomer's knife. There's perennially jumpy and foolhardy Simms (Franklyn Seales) and the dope-smoking Cribbs (T.K. Carter), who seems to enjoy riling morally upright "Coach" Bowden (Carlos Brown), whose fragile mental stability soon buckles under the strain. And after Poole is shot and killed, the platoon falls under the command of Sergeant Casper (Les Lannom), who though nominally in charge clearly lacks the necessary authority to lead. On paper at least, this group composition and its subsequent dynamics appear to have their roots in any number of platoon-based wartime dramas – there's the tough one, the cynical one, the nice one, the nervous one, the religious one who goes nuts – and appears primarily designed to provoke internal conflict. But there's a logic to both this personality variance and the soldiers' disgruntled lack of enthusiasm for their role, one that will likely fly over the heads of a good many British viewers (it certainly did mine). 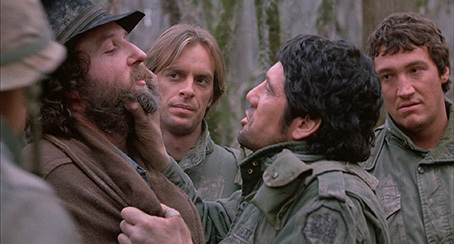 Although released in 1981, the film is set in 1973 at the tail end of the Vietnam War, when one of the few legal ways to avoid the draft was to join the National Guard. The men here are thus likely not wannabe professionals but the reluctant recruits who would rather be anywhere but on military manoeuvres in the Louisiana bayou. It's an attitude illustrated by Hardin's response to being asked by Sergeant Poole how he likes being in the Louisiana National Guard. "I don't," he glumly responds. "But then I didn't much like being in the Texas Guard either." As an astute reviewer pointed out on the film's initial release, this is not a battled-hardened and experienced platoon, but men playing at soldiers who find themselves in a situation that they are ill-equipped to handle. They lack the weaponry, training and real combat experience to pull together effectively as a team, and that they make dumb mistakes and turn against each other thus feels both plausible and inevitable. That we engage so quickly with this disparate group is down to combination of a tightly structured and sometimes witty script (by Michael Kane, Walter Hill and regular collaborator David Giler), some savvy casting and well-judged performances across the board. Keith Carradine absolutely nails the role as the amiable Spencer, mixing a pragmatic cynicism with an engagingly dry wit (when the group are wading through a bayou in search of a highway, Spencer quips "It used to run right thought here. Those ecology boys must have moved it") to make him the most easily likeable character in the film, and in a pair of strong early roles for two up-and-coming actors*, Fred Ward makes for a convincingly dangerous Reece and Powers Boothe keeps newcomer Hardin interesting and sympathetic, even as he paints him in darker than expected colours. And the one-armed Cajun trapper that Bravo Team capture is none other than the excellent Brion James, who the following year would find wider fame as Leon in Blade Runner. Despite the realism of its setting and Andrew Laszlo's gorgeous, militarily coloured cinematography, there is still an element of stylised artificiality to some elements of the film, particularly the night-time campfire dialogue conversations, which feel as posed and rehearsed as the title sequence exchanges in the more comic-book toned The Warriors. The Deep South setting does ensure that the ghost of Deliverance sometimes hangs over the proceedings, and there's a stalk-and-slash element to the slow whittling down of the platoon at the hands of largely invisible aggressors. But such is the nature of the modern survival thriller, and it's worth noting that Southern Comfort pre-dates the similarly themed Predator (soldiers picked off one-by-one by an unseen enemy in a jungle setting) by a full six years. 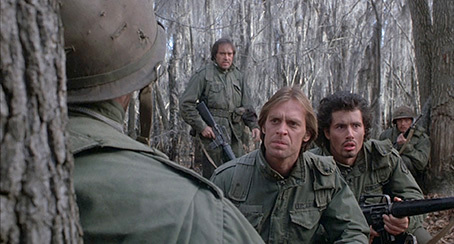 Hill himself has more than once stated that the film was not intended as a Vietnam parable, and even issued a dictum to the cast at the start of shooting that if they played it that way they'd be booted from the film. But given that this is the tale of American soldiers in unfamiliar jungle terrain whose disdain for the (non-English speaking) locals prompts an aggressive response, it's hard to believe this wasn't an influence, particularly given the year in which it is set (it has, of course, since been given a more contemporary edge by revelations about the behaviour of some American military personnel towards locals in Iraq). But while these elements provide the film with its thematic meat, it was designed primarily as a low-budget action thriller and on this score it delivers without ever tipping over into implausible excess. Indeed, despite being made in the early 80s and set in the 70s, it never feels dated or locked to the period, which is as much down to the focus on character and the personal nature of the conflict as the seemingly unchanging nature of the uniforms and weapons with which the soldiers have been equipped. And the set-up itself enforces a welcome level of restraint – where the muscle-bound soldiers of Predator unleashed enough bullets to take out a battleship, Bravo team are armed only with blanks, bayonets and a couple of live rounds apiece and really do have to rely on their wits to survive. Rather than focus on action and pace, Hill employs a slow burn approach that, with the aid of Ry Cooder's hauntingly atmospheric score, transforms the bayou itself into a threatening entity, one that intermittently lashes out at these unwelcome interlopers. It builds to a show-stopping final twenty minutes in which the surviving members of the team become locked in a final breathless showdown with their relentless pursuers. It's a grippingly handled and genuinely nail-biting finale, electrifyingly cross-cut by Hill regular Freeman Davis to the uplifting accordion and vocals of Cajun dance tunes, whose performance is impeccably worked into the edit. Hill has continued to make his share of interesting movies (and let's not forget that he directed the first episode of HBO's Deadwood), but it's for his first five features (six if your throw in 48 Hrs., a far smarter film than its blockbuster success sometimes suggests) that I continue to hold him in such high regard. In their dramatic tone, their handling of action, their Ry Cooder scores and their excellent ensemble casts, Southern Comfort and The Long Riders feel like like cinematic blood brothers, and even thirty years after their initial release, they play so well that I can't help wishing Hill had continued in this vein for just a few years longer. For some reason my hopes were not that high for this Blu-ray transfer, a view likely shaped by distorted memories of gritty and grainy visuals and a narrow colour scheme. And while this recollection is not entirely without foundation, it is based on a relatively small number of shots in which Hill and his editor Freeman Davis have reframed the image through a process of optical enlargement, which softens the detail and enhances the grain. This is not, it should be noted, the result of retrospective tinkering of the sort you'll find on The Warriors Director's Cut DVD, but was carried out at the original post-production stage – on those early cinema viewings I was keenly aware of this process on one shot in particular that also involves a short optical zoom. With this in mind, the quality of the resulting transfer is, for the most part, considerably better than I was expecting, and its superiority to my previous MGM region 1 DVD release is immediately and very clearly apparent. The picture here is noticeably sharper and more detailed than the DVD transfer, the colours more natural (the greys and greens of the bayou look particularly attractive) and the contrast range far more generous, revealing picture detail in darker areas that is invisible on the DVD, but without sacrificing the crisp black levels. The Cajun village finale, with its wider range of colours and the punchier lighting, is particularly impressive. It's a very clean transfer, with only a sprinkling of small dust spots remaining. It also survives one of the biggest challenges for digital presentation of material shot on film in the shape of a scene set in thick mist, which is rendered without any obvious artefacts or banding. The picture is correctly framed at 1.85:1. The Linear PCM stereo soundtrack lacks the bass response and punchy dynamic range of more modern tracks, but is still a very serviceable job with for a relatively low budget film of the period. A welcome retrospective interview with Walter Hill that runs for a good length, in which the director outlines his intentions for the film and how it came about, and provides some intriguing details about the shoot itself (shots done in the bayou had to be carefully planned and quickly filmed as the tripods would start sinking). He devotes considerable time to the individual cast members and reveals that Carlos Brown (who plays Coach) was a former football star who, having discovered his true parentage during the shooting of the film, changed his family name and eventually became the two-term mayor of Fresno (that he also became a born-again Christian who campaigned against gay marriage is tactfully steered clear of). It's also here that I learned for the first time that joining the National Guard was used as a way of avoiding the draft during the Vietnam war, and it was rather nice to hear that Hill still considers his collaboration with Ry Cooder to be one of the highlights of his career. A still seriously impressive survival thriller that has handsomely stood the test of time; the casting, script, performances, direction, cinematography and editing are all first-rate, and a final layer of polish is provided by Ry Cooder's sublime score. A solid transfer lifts the image quality well above that of the previous DVD, and the interview with Hill is a welcome (if solitary) extra. Warmly recommended. * Although this was his first major role in a theatrical feature (previously he had played only small supporting parts), Powers Boothe had the previous year won an Emmy Award for his riveting performance as the titular cult leader in the TV Movie, Guyana Tragedy: The Story of Jim Jones.